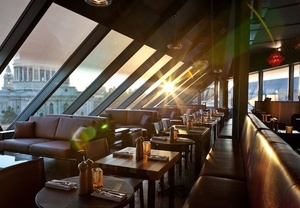 It's a stretch to describe Madison, the swanky bar and restaurant on top of One New Change, as a pub. Nevertheless, the venue will hold what it describes as a "posh pub quiz" on 29 April, as it tries to entice some clientele into the City on a Sunday afternoon. MC for the evening is Chris Madigan, described as a writer, broadcaster and all-round quizmaster maestro. All quiz-goers will receive a complimentary drink on arrival, with tapas and cocktails on the menu (not free). You can also enjoy one of the best views in London, from the sixth floor of One New Change, opposite St Paul's. Teams can include up to four people, and you should email onenewchange@showmedia.net to register, giving your team size and stating whether you'd like to eat. It's technically free to enter, but teams are encouraged to give a £10 donation to The Prince’s Trust, the shopping centre's charitable partner.